Google AdSense is a most loved money making a program for bloggers since ages. Almost all the bloggers who start their blog first have dreams to earn money through AdSense and Google AdSense is only sure-shot advertising program for publishers around the world. As Google AdSense is a biggest publisher Ad network around the globe, it is strict and new bloggers don’t get approved for AdSense easily. It’s very hard to survive on AdSense, they only love ethical websites and blogs, even a little spamming or unethical activity on your blog can get your account ban permanently. Well coming on the point, here we will show you how to verify Google AdSense account in India using Aadhar card or other government documents. This is an alternative method to verify your Google AdSense account for enabling payments. This can only be done if you have not received google verification postcard from your address. If you have received the AdSense PIN postcard on your address, then you can simply log in to your account and enter the 4 digit pin to verify your account. But if you are not receiving the pin then follow the below alternative method. What is Google AdSense pin verification? You must be knowing google AdSense sends you a physical PIN postcard to your address when you reach $10 in your account. This is to confirm your residential or commercial address before they can send your payments. In India, the unique PIN letter arrives maximum in three-four weeks. But in some remote areas and a smaller town, it may take longer. In some cases, it doesn’t arrive at the address properly or gets misplaces by the post office and hence we have here the second alternative way to confirm & verify your AdSense account using Indian government identity card upload. PIN verification is mandatory for Address Verification of your AdSense account. 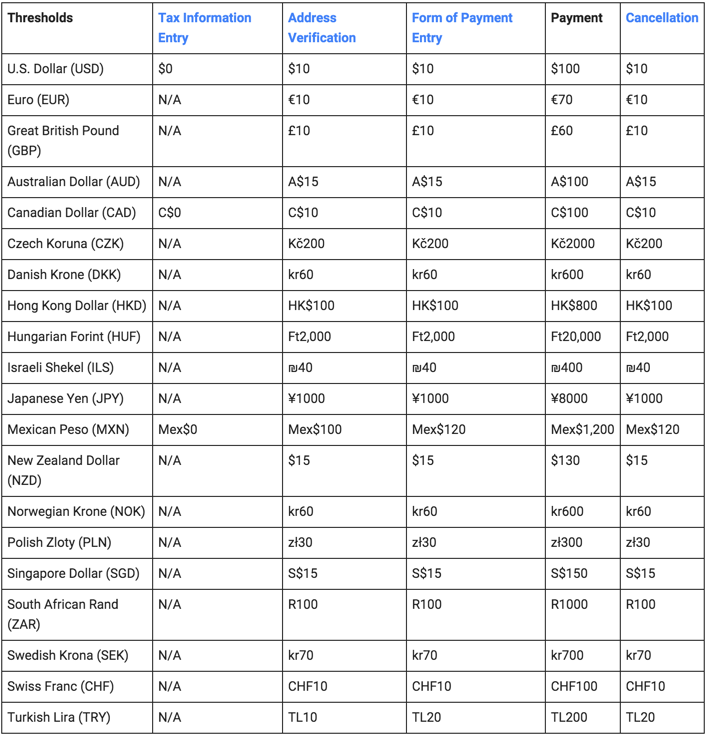 Here is the chart for address verification threshold or various countries. How to Verify AdSense account using Aadhar card or Passport? According to Google AdSense official blog, you get maximum of three attempts to receive a unique pin for verification, even after three attempts you are not able to receive the PIN verification letter that you may verify your account for payments using documents upload feature. You can upload Aaadhar card, passport or any other government recognized documents which is having your address. PAN card will not work here as it doesn’t have an address in It. Make sure the address mentioned in your documents is same as what you have mentioned in you Google AdSense account. This step will only work if you have already applied for PIN 3 times and have not yet got even after waiting for a month. At first, you need to have an Aadhar Card or international passport. Aadhar card was launched years ago with the 12-digit individual identification number issued by unique identification authority of India on behalf of the government of India. Aadhar card works for Identity and addresses proof all over India on bank levels, hotels, government offices and now on Google AdSense too. Here is how an aadhar card looks like. Now login to your AdSense account and go to dashboard. Got to a section of ID verification. Fill out the form by providing all authentic details. ON the form, enter your email, name, AdSense publisher ID and upload the documents. That’s it! Now you need to wait for AdSense team to reply. It takes approx. 30 minutes to 24 hours to get your account fully verified and enabled for payments. Once you will reach minimum payment of $100, You will be paid. In India now Google AdSense pays through bank transfer (Wire) So add your bank account number, IFSc code, Swift code in your AdSense dashboard to get paid directly. It’s painful to wait for PIN from AdSense and many new bloggers get frustrated because of this traditional verification, many hopes are shattered once AdSense bans them and it’s really painful. To earn a legit income online, you should always concentrate on the quality of your blog and should have lots of patience, Online earnings doesn’t generate so fast, but once you start earning, you will never regret. We have shared all the details to verify google AdSense account without PIN. If you have any more doubts regarding AdSense payments verification, please ask us using the comments section below and we will help you as soon as time allows. Till then Happy Monetizing. can it be done using phone verification. NO, For now Adsense can’t be verified for payments using Phone verification, However it is easier to verify it using AAdhar card or other government issued documents. I am hostelite.. So i gave address of my hostel for address verification.so obviously its different from my permenant or home address. If I upload aadhar card for identitiy verification will it be accepted ?? Or if suggestion please suggest. Thank you. Yes, You can upload your aadhar card or also can give your HOme address and any person in your home can tell you the PIN Received. Sir can i verify my aadhar card if I am less than 18 year old and put bank account of less than 18 year ? Brother thanks ok can we address If 1st pin not arrived than. Great…!! that’s great advice google adsense good work, I read and also saw your every post, nice artical very usefull your post Thank you so much for sharing this and the information provide. I sent an Adharcard card to AdSense. But Could no be verification…. please edit your name and make it correct one and then apply for verification again. How can I Verify Identity in Case of indivisiual Adsense Account but in name of my Firm in which I’m Propriter ? i have verified my AdSense account with PIN which is sent by google ,after that it was asking about address verification document.when i upload my scanned Adhar card for verification, i was failed due to profile name doesn’t match with it. After that i have changed my profile name then i tried to upload but it was not uploading and saying “The name on the document doesn’t match the name on your profile”.please help me how to verify my address proof document. My address has been verified with a pin but still, Google is asking for my identity verification. Now my id card has a different address and I received a pin on a different address. Now, what can I do to verify my identity? Please Help! My AdSence identity verification is failed. What is next, can you please help me.